Dia Dhuit! It's been a few weeks since I managed to sneak a few days away in Ireland, so thought I'd better write up the post before I completely forget what I did. Mr FHCS had meetings to go to on the Friday, so I had a full day - and full stomach after a full Irish breakfast - to wander around the town and amuse myself. Limerick is really quite small, and our hotel was just on the other side of the river and visible from the main road in the centre, so even I with my notoriously terrible sense of direction was unable to get lost. In addition to such exoticisms as green postboxes, the first thing you notice about Limerick is an incessant beeping noise around the city centre. For some reason the street crossing boxes make a bloody awful noise the whole time, getting faster when when it's safe to cross, unlike the crossings here, where you press the button and wait for the sound to tell you to cross. Now of course I understand that the tone is for blind people who can't see the red and green men, and I guess it's confirmation to the blind that the crossing is actually working - but oh my God it's irritating. Obviously their need is greater than mine, but noise pollution is a pet hate - there must be a better way. At least the view as you cross the bridge into the centre is lovely. Anyway, my Victor Meldrew-isms aside, I settled down to a day of exploring the shops. The first shop deserving of a stop was Mr Simms Olde Sweet Shop, which is as you would imagine a dieter's nemesis, where I picked up some chocolate pirate lollies for the boys, some New Berry Fruits for my mum and a hefty slab chocolate covered coconut ice for my Grandad. I'm still pretty amazed that I didn't succumb to buying anything to scoff myself - quite a feat when you consider that I am a great lover of traditional style sugary tooth-rot - anything that will pull out your fillings (or give you more) is good with me. 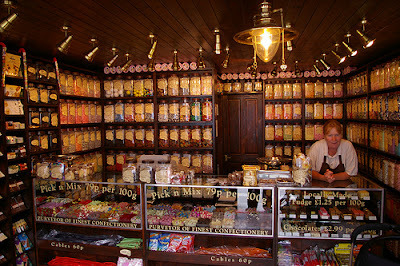 I'm definitely getting white bon-bons next time I'm in a proper sweet shop. Seeing hoards of girls with paper bags - Ireland has outlawed plastic carriers - outside one shop covered in SALE signs, I stuck my head in to discover that Penneys and Primark are one and the same. I had previously been certain that Croydon was an outright leader in the dubious fake tan stakes, but I'm pleased to announce that in Limerick Penneys orange was being rocked like nowhere else. I did have a quick scan of the 50c jewellery aisle, and found the daisy earrings I wore to the 60s wedding - tacky but bargainous! However, there is a very nice interiors shop in the Habitat kind of vein called Instore - I might have bought a few things if it were not for Ryan Air's miserly baggage allowance - and the slightly hidden gem is the covered Milk Market. Different days have a different focus, but it's mainly farmer's market type produce, artisan breads and cheeses, crafts and the odd car boot type seller. There are also permanent shops and cafes around the edge, and a stage at one end where a local band were performing. I chatted to a few sellers, including Ruth Crean - always nice to meet a fellow blogger - who had a lovely stall selling a variety of her handmade items. She also sells her customised and upcycled clothing creations in a local boutique. Of course, I also hunted down the charity shops, and here things ranged - if not from the sublime to the ridiculous - at least from the good to the grotty. Oxfam was the same here as anywhere else, a bit bland and colour co-ordinated and with a sweet but innumerate old lady on the till. [I bought a scarf, and it cost one euro. I gave her one euro. I'm not sure how this became difficult]. Gorta was recommended to me by a girl at the Milk Market, and whilst I know some people will hate its boutique look, the Mary Portas effect hadn't spread to the pricing. There was a rack of clothes in the centre of the shop all priced at 2 euros, and I found plenty to try on. I came away with a nearly new tulip skirt from Full Circle. Angela's Ashes. Dead babies and remitting bleakness. The tourist board are still keen though. I asked the manageress if it had been made compulsory by law for every charity shop in the city to display a copy of Angela's Ashes. [Frank McCourt's best-selling book about a truly dire childhood in 1930s Limerick. Like those horrible exploitative misery memoirs but considered proper literature] She wasn't amused. On to Mrs Quin's Charity Shop (working for people with sight loss in Ireland). This was more your traditional pile it high and rummage whilst breathing through your mouth kind of place - there was a copy of Angela's Ashes there too - and it reminded me of the grimmest stall at the car-boot sale. You know, the one selling a pile of grey old bras, 2 wire coat hangers and a beanbag which looks like a dog died on it. Run by a woman wearing a fleece with wolves on it who sticks her grimy fingers into a tub of body lotion she received in 1982 in an attempt to persuade you to 'test' it. I was always under the impression that charity shops were told not to sell opened cosmetics, but obviously the memo hadn't reached Mrs Quin's, who were trying to flog a half empty Origins ginger body scrub with added bathroom fluff. Yummy. Queues at dawn. Do the cherubs count as one item or two? Nothing in the window caught my eye enough to warrant a return on the Saturday, but I did buy a couple of belts for 50c each. Does anyone live by a charity shop which has a similar policy? What do you think - good idea or annoying in the extreme? "All I want is a pint of Guinness..."
Sorry, this seems to have turned into a bit of a mammoth post. I'll just leave you with the confirmation that I was indeed little girl number one on the cover of Twinkle [I'm sure you've all been on the edge of your seats]. I may return to the fringe one day! I've seen a couple of posts recently mentioning the 9am queue-type arrangement, I think I'd find it bloody annoying if truth be told :-) Loving the little decoupage birdies and cats on the boarded up windows, great way to cheer up the windows!! Ashbourne charity shops all seem to have a fairly prominent couple of copies of Angela's Ashes too - that and The God Delusion lol. yeeuchhh on the already-opened toiletries! Why would anyone even donate them?! I for one, am delighted to read a 'mammouth' post from you - I have missed you! I now want sweets, I want to erase the image of Frank Mc Court having a pig's head for Christmas dinner (yes, mum made me read it, before telling me she heard on Radio 4 half of it was exaggerated), I want to see a green post box, and I want some badges. Strange as it may seem - I'll give the chazzas a miss. I'm not great with'rules' in shops (and have enough nylon Prada bags to sink a ship)! Lovely post, cheered me up a treat. I've never seen that window thing before but it would make me completely batty if something I wanted was in there. I mean, you find it..you get it. They don't need a huge competition for it. We have those chirping crosswalks here. Our chirp like birds instead of beeping and I always think that it's baby birds at first and then I realize, "Duh...just cross the street!" Thanks so much for featuring so many pictures of my stall! I'll link to this post from my facebook at a more socialable hour when more people are likely to see the link. It was fascinating to read about Limerick from an outsiders point of view. -Yes there is a high concentration of the tangerine girls outside of Pennies, they flock in hoards around there! -Yes it is really sad that a lot of our shops have closed down, this is mostly due to the doughnut effect of having lots of shopping centres outside the city, then add on the recession and boom, mass shop closures. Hopefully over the new couple of years the place will come back to life though. -The window thing is quite common for all the charity shops, it's a bit frustrating but I think they are trying to build up a demand. You actually missed a much worse charity shop(quite near to Mrs.Quin). It has mountains of over priced smelly junk, and I don't think it's ever been cleaned...I'm glad you missed that one it's awful! "You know, the one selling a pile of grey old bras, 2 wire coat hangers and a beanbag which looks like a dog died on it." HAAAAAAAAA HAAAAAAAAA HAAAAAAAAAAAAAAAAAAAAAAAA!!! Oh so true. I think it is the "law of the Boot Sale". I have to say, as dire as Angela's Ashes is in context - I really enjoyed it! And that "come along on Saturday" charity shop? No thanks. I'll have a lie in! Angela's Ashes is indeed depressing. Can't get over the green postbox though. GREEN! gotta love a green mail box! Love the art on the boarded up windows! What a silly idea as if you want to wait up to a week to find out the price of an item. Love your description of the grimey bootsale! Oops, just proofread this morning and re-added half a paragraph that mysteriously went missing! Ruth - oops, maybe I am maligning poor Mrs Quins by confusing it with the grotty neighbour. This is the trouble with not writing up posts immediately. From your description it certainly sounds like the one I mean! I know I went in lots of them. Angelas Ashes must be an Irish thing - every CS I visit here has at least 2 copies of the DaVinci code for sale! They'd have to be sold gold cherubs to be worth queuing at 9am for. What a bizarre policy, not one I've encountered on my charity shop travels. Love the kitty/birdy building cheer-up decor. Heh! I love reading about grotty charity shops! My 'best' so far is the stall at a french flea market that sold second hand knickers, mainly g-stings and nothing else. G.R.O.S.S! I LOVE the green mail boxes, and I so want a blue peter badge from that stall! Love your analysis of the charity shops - I recognise every type. I've experienced the window thing in the local Dalston Oxfam shop. When I asked how much an item in the window was ( an umbrella holder decorated with a Toulouse Lautrec print) the lady behind the counter told me only the window dresser could go in the window, and they wouldn't be round for a good week. I couldn't believe a charity was turning down my money! But then this branch of Oxfam is a bit trendy, with its own Facebook page, etc. A queue up charity shop. Sort of like an auction then? Hm. Not sure I like that idea. Oh I love this blog!!! My husband has renamed our local car boot sale "The S*$!t heap" awful I know but actually he is not far off the mark. The sellers look as though they have all descended off the hills after mutating following a prolonged nuclear attack. Please write more often, I'm sick of reading blogs preaching about how a family of four can live on three and eleven a week. When I lived in Vancouver, Canada, I was a frequent haunter of the Salvation Army thrift store round the corner. They had the same "good items to tempt you but you'll have to queue on Saturday" policy. It drove me nuts. Also, prices had started to get truly silly by the time we moved to France three years ago. Euros here go a long, long way at vide-greniers (attic-emptyings), Emmaus (charity shop) and depot-ventes (consignment stores). Interesting post - haven't come across the first come first served routine before! Hope it doesn't happen here. Oh I bet there was queue a mile long for those cherubs! I saw that window sign too in a CS in Ireland - thought it most strange and tbh would find it irritating as hell if it happened over here. Where is the thrill of seeing a new window item and having the 'glow' of knowing you've bagged the bargain before anyone else. Good to have you back hun. I nearly spat tea on my keyboard when I read the bit about the lady with wolves on her fleece! I can picture her and her fingers dipping into the body lotion. Bleugh. Wow you really took the town. Very thorough post. I like the grey bras and dead dog bean bag joke. Dont u love talking to strangers, saying a really good joke and they are unamused? Its like you wasted a good joke. Good thing you have a blog to publish them on funny lady. Verrrry odd about the 9am queuing thing, though I must admit I'd be tempted for that granny blanket. I loves it! How utterly BIZARRE!!! I have never seen a sign quite like it. It's almost a PR stunt to generate more interest than what would normally be there. I love all those badges. My husband used to love a band called Boy Racer, so the badge featuring the Penny Farthing made me chuckle. Great, hilarious post as usual Lakota! I love your descriptions of anything weird, tacky or slightly grotty! Limerick sounds nice! Hahahaha you have made me chuckle! I agree that The Da Vinci Code is the must-have book in most of the charity shops I go in, but I'm going to keep a lookout for Angela's Ashes now. We have a St Vincent de Paul shop nearby and they don't have the same window policy. It's a complete shambles of a shop with crazy volunteers but I kinda like it that way. No Mary Portas effect there, thank you very much! I have also been told that I couldn't buy an item out of the window in a charity shop, until the window display was changed the following week. How hard is it to take a dress off a mannequin, sell it, and replace it with another one? I used to volunteer in Oxfam YEARS ago, and loved doing the window - if people want the stuff in it, it shows you've done a good window, doesn't it? Ha ha good to have you back Lakota! Thanks for the ace guided tour of Limerick. What a fab post! Love your description of the 'breathe through your nose kind of charity shops' and the sweet but innumerate little old ladies - every Oxfam has at least one! Oh my! That's where my family are from, and some still live there. Yes Ireland has suffered terribly with economic down turn. It was funny to hear your description of Penny's - it really is much better than Primark, less jumble sale like and much more organized! LOVED you description of the fusty charity shops! I laughed aloud at the body lotion comment. You made me miss home though even the Vinnies. I've only been to Limerick once, but your post pretty much summed my memory of the atmosphere of my visit - starting off cheerily and then getting progressively greyer! Sounds really depressing! Thank you making me laugh out loud! Of all the vinnies round me (and they are everywhere) only one that I can think of has a window display that goes under the same policy,although its a Thursday for us! Thankfully I dont think I have ever missed out due to this, the selection criteria for these window worthy items seems rather different to my own, same goes for the 'premium' rack, I find better stuff on the regular rails anyway. Love those green post boxes too, that is my favourite colour. Hope you had a brilliant holiday! A super post and those photos are great. I love those felt brooches and that boarded up house is brilliant, what a fab idea! I love the post boxes - in ANY colour! That Saturday thing is ridiculous. My local Salvos change their window displays on Monday and if you want something from the window you have go back on Monday - that's great for people who don't have JOBS! There has never been anything in the windows that I've wanted, but if there were, I'd just bribe the staff to get it for me. I love those super cute felt brooches. And I'm pretty sure charity shops everywhere are required by law to have Angela's frickin Ashes AND The Da Vinci Code on display. I'm with Sarah, there's never anything decent in charity shop windows..ever! I think it's law that they are dressed by pensioners with a penchant for Per Una. What a bizarre policy. I love those little decoupage animals, very sweet indeed. As I person who went to Uni in Limerick for 6 years, I think I only ever bought one thing in it's charity shops. They smell so musty! Haha, I think every charity shop in the WORLD has at least ONE copy of Angela's Ashes! I’m glad none of my shops have that high value policy. That would make me angry. But I do love the loyalty card idea! Sounds like you had a nice trip! I don't think it's just in Ireland - Angela's Ashes seems to be a requirement for every charity shop in England too! And the strict window policy is a bit odd - my mum had a run in over a similar rule twenty years ago (and still complains about it! ), but I thought it had disappeared now! green letter box is amazing!! Oh my goodness. I love reading your blog! Not just for the content, but for all of the wonderful colloquialisms I don't get on my fellow US blogs ;) Can a girl from the US--and the deep South of the US no less--say "bloody awful" without sounding ridiculous?! Probably not. Love your blog! Insomnia and noisy babies - the bright side! Christmas Charity Shop Swap - Sign up here! It's all about ME, darhlink!